I just heard that the number one reason for summer breakdowns is an overheated car! I don’t want to be one of those stranded motorists. How can I prevent an overheated engine? If it does happen, what should I do? Besides air conditioning problems, overheated engines and coolant problems are one of the most significant summer heat issues. Your engine goes through a lot of continued heating up and cooling down throughout the day. If just one component is not working properly, your engine can overheat causing many problems, not the least of which is costly repairs. We’ve all seen them. Cars and their owners helplessly sitting at the side of the road with an engine that is steaming. Not only extremely inconvenient, but also potentially dangerous. Low coolant levels-It is the radiator’s responsibility to keep you engine working at an optimal temperature and it is the coolant that you put in that allows this to happen. Periodically check the coolant tank to make sure you have the right level of coolant. Only do this when the car is cool!! NEVER remove a radiator cap on a hot car!! The tank is located near the radiator cap and looks like a plastic milk jug. It will have a mark on the side so that you will be able to adjust your coolant level effectively. If you notice your coolant level is low or if you see red, blue, green or yellow drips or puddles around your vehicle that have an oily surface, you may have a coolant leak. If you see these leaks, take your car to Honest-1 right away. A car running without adequate coolant is sure to overheat! Low engine oil- When is the last time you have had an oil change? Low engine oil causes an engine to work harder and retain heat. On hot summer days, low engine oil can definitely cause a car to overheat. Make sure you are getting regular oil changes to prevent this problem! A broken fan or fan belt- When your car’s cooling system needs additional help, a cooling fan will often kick in. If the fan malfunctions or the belt used to drive the fan breaks, your engine can overheat. Belts under stress can crack, wear unevenly, or break. When you get an oil change, Honest-1 technicians will check your belts for these symptoms as part of our comprehensive vehicle inspection. However not all oil change places will do this, so if you find yourself in another location, please ask! Unfortunately, as much as you try to prevent these things from occurring, breakdowns do occur. 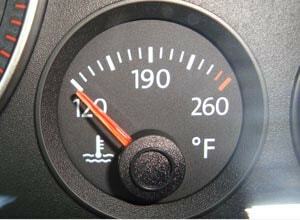 If your engine is in the process of overheating, you will notice the temperature gauge in your car starting to climb. What do you do if you see your temperature gauge is climbing? If you notice your gauge moving towards the red and it goes over the ½ way mark, find the nearest safe place and pull over. If there is no steam and the gauge did not go all the way up, turn the engine off but leave the keys in the ignition. This allows the cooling fans to run helping to cool the engine. Once pulled over, pop the hood and, again, if there is no steam, open the hood all the way. Allow the engine to cool at least 30-45 minutes and then try to get back on the road keeping a close eye on your gauge the whole time. Do not run the A/C if you can prevent it. When you get to your destination, call Honest-1 so we can get you in and our technicians can troubleshoot the problem. What to do if your temperature gauge is all the way up and stays in the red? If your temperature gauge is all the way up, pull over at the nearest safe spot. If you cannot pull over immediately, turn off your A/C, put down your windows and turn on your car’s heat at full force directing the vents outside. This will pull the heat from the engine allowing it to cool. Turn on your hazard lights, drive slowly, and keep a close eye on the temperature gauge at all times. Pull off as soon as you can. If there is no steam, pop the hood. If there is steam, wait until no more steam is coming out and then pop the hood. When the hood cools, open the hood all the way. In extreme cases, the engine may keep running after you try to turn it off. In this situation, you will want the engine to stall, so put on the handbrake and put it into gear. This should do the trick. If you have Road Side Assistance, call them to have the car towed. An overheated engine is a nuisance at best and dangerous at worse. The best way to prevent overheating is to keep your regularly scheduled maintenance visits and keep an eye on your car. Look for leaks, listen to strange sounds, and be watchful for warning lights on your dash. If you have any questions, be sure to ask your Honest-1 team. We are always here to keep you and your family safe on the road!